Apple’s Airport Utility, version 6.0 introduces a graphical look that mimics that of the iPad version. But it also loses some functionality compared to the 5.x version. 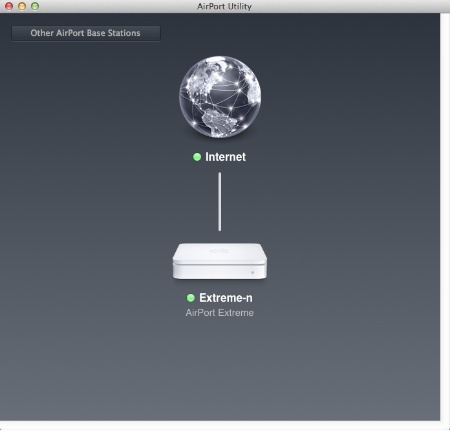 On January 30, Apple released Airport Utility 6.0 for Lion. It requires at least OX X 10.7.2. Its chief attributes are that is it has the look and feel of its iPad counterpart and is easier to use than previous versions. If you had been using AU 5.5.3 on Lion, the update will replace it with version 6. Because version 6 isn’t as full-featured as the previous version, Apple has made an upgrade to the original app available, AU 5.6. If you’re still using Snow Leopard, you should continue to use Airport Utility 5.5.3, It requires at least OS X 10.5.7. Airport 6 for Lion appears to be an attempt to bring visual harmony to the AirPort Utility series. Of course, the reason why we have AirPort Utility 1.0 for iPad is so that customers who have a home Wi-Fi network but not a computer can configure the AirPort base station with their new iPad. In the spirt of the iPad version, if you click on an icon appearing on the home page, you get some information. The small gray information box has an Edit button so you can change the configuration. From there, the pages (tabs) look a lot like the previous version of the app. However, unlike the previous versions of AU, the configuration pages are semi-transparent which looks odd and doesn’t really add to the usefulness of the application. Because AU 6 is simpler, it’s easier for most average users to get going with. It still offers the ability, under the Network tab, to operate in “Bridge” mode. 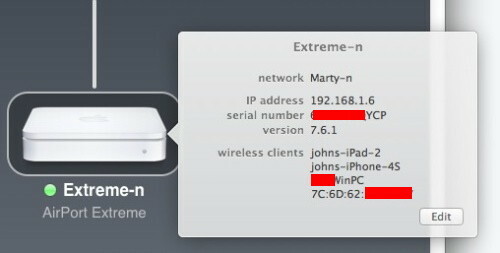 That means that if you already have a non-W-Fi router connected to, say, your AirPort Extreme, you can just let the Extreme pass the DHCP addresses on to your wireless devices. That keeps them all in the same subnet which is usually desirable. 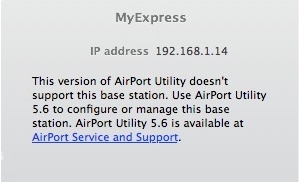 Or you can let the AirPort Extreme issue it’s own DHCP addresses and specify the range. Other than the slightly glitzier look and some considerable loss of function, the new version is pretty much the same as the older 5.x series in its look and feel. The fact that Apple now has two Airport Utilities raises the question about whether Apple should bury advanced features in a new version or have two versions. For now, we get two versions. And because one would think that a version 6 is better than a version 5.6, the situation can become confusing. But then two different names for the utilities could also be confusing. The good news is that if you’re a beginner with the Mac, OS X Lion and home Wi-Fi, AU 6 will likely be all you need for now. It gets a solid 3/5 rating.